Snapdeal 5 deals at Jaw-dropping prices @ 5PM. now Snapdeal is offering 5 deals at Jaw-dropping prices @5PM today. 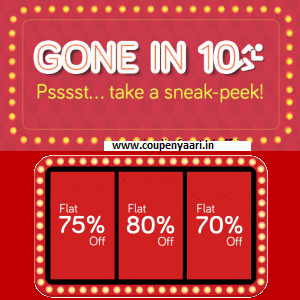 How to Avail 5 deals at Jaw-dropping prices @5PM today? There’s a treasure hunt waiting! WTH? What about the rules of the game? : Rules? Already? Really? Oh C’mon! Alright! FINE! Come back at 4:45pm to find out. When does the treasure hunt begin? : At 5pm, of course! How long will the crazy deal prices be available? : Till stocks last! How many crazy deals can I grab? : All 5! – Damnnnn! You’re lucky, if you do! Can I win/buy more than 1 of each?:Ooops! Don’t be selfish! Give others a chance too!